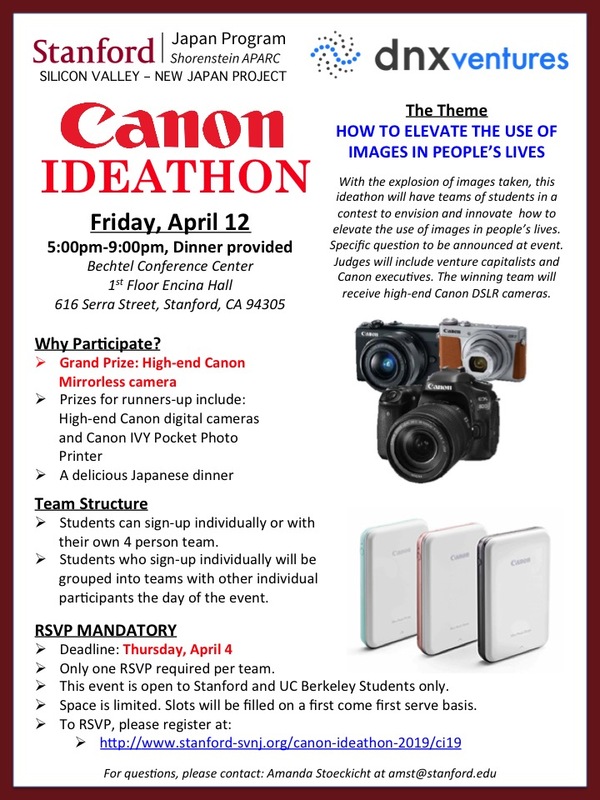 With the explosion of images taken, this ideathon will have teams of students in a contest to envision and innovate how to elevate the use of images in people’s lives. Specific question to be announced at event. Judges will include venture capitalists and Canon executives. The winning team will receive high-end Canon mirrorless cameras. Doors open to the ideathon at 5:00pm. Dinner will be from 5:00pm-5:30pm with the main event starting at 5:30pm. All participants must be checked-in by 5:30pm in order to participate. Only one RSVP required per team. NOTE: For those registering as a team, you must declare all members of the team at time of registration. Member substitute/changes are allowed post-registration. Space is limited- only a few slots left. Slots will be filled on a first come first serve basis. This event is open to Stanford University and UC Berkley students only. For questions, please contact Amanda Stoeckicht at amst@stanford.edu.